I had already been to first, second and third base with travel by the time I reached Ghana. I’d had light dalliances with the West Coast of North America and some superficial, fleeting affairs with the usual places in Western Europe. I’d lived in Ireland for a while, then in London. I did a few backpacker loops through France and Spain and the tiny Benelux countries. A month in then-East Germany, to top it off. In fact, I’d spent about four years abroad before I finally lost my travel virginity. “I’m going to go stay at my friend Rick’s place in Ghana for January, need to get out of London, ” said my housemate Janet, sometime in late December, a decade ago. Rick was a fashion designer, had lots of money and lots of time and had built himself a very simple little shack on the coast of Ghana as a retreat from London’s mania. No electricity. Running water only if the big water tanker truck had remembered to refill the tank. Squat loos. Bucket showers. “Can I join you?” I asked. She shrugged affirmitavely. We went off to Highgate to arrange our complicated visas at the embassy. When we finally flew in on Balkan Airlines via Sofia, Bulgaria and Tunis, we were already slightly stunned. Our flight had had illegal stowaways that had to be, well, deposited in Tunis. The remaining passengers had brought aboard more carry on baggage than I could fathom, in enormous plaid, plastic shopping bags that filled the overhead bins, the aisles, the nooks and crannies. In the toilets, there was water pouring down from overhead in a constant waterfall. We were served 10% alcohol Bulgarian beer and a fluorescent pink piece of cake. The seat backs were fixed in a permanently reclined position so all you could do was lie back and stare at the ceiling, drinking your 10% beer and nibbling your fluorescent pink cake. Upon landing and emerging from the plane, the wall of heat at the top of the stairs was intimidatingly thick and hot and wet. My brain screamed out in panic– Can’t do this for a month! Must go back! Let’s go back! Terrified! Customs and immigration was everything I’d initially feared before I had started travelling- stern men in military uniforms unzipping your bag and hauling everything out and grilling you about your underpants and paintbrushes- but had never actually experienced in travels around Europe. Clumsily repacked, we emerged into the chaos of arrivals, thronged by taxi drivers and bag-carriers and wannabe-guides. Noise, dust, heat, crowds. 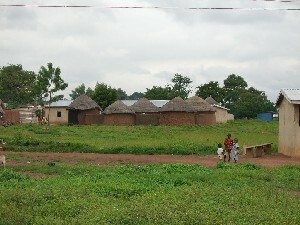 We got a taxi, told him where we wanted to go, negotiated what we later learned was a hilariously high price, and bumped away down red dirt roads to the village of Kokrobite, about an hour from Accra. We stayed in that little one-roomed house with one foam mattress for the two of us and squat toilets and bucket showers for a month. We ate fish brought in by the fishermen on the beach, and big plates of tomatoey jollof rice and starchey, gooey fufu dipped in spicy okra soup and sticky fried plantains and endless pineapples. I woke with the roosters at 4am because I couldn’t do otherwise. I slept at 8pm, because it was dark. A small boy came by every evening with lit kerosene lanterns, placed on front porches and front steps. These weren’t bright enough to keep me awake though. 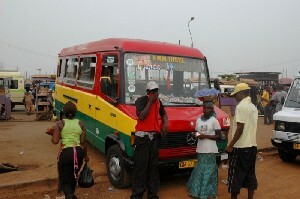 We rode the overpacked minibuses called trotros into Accra most days. I sat with burlap bags of chickens on my lap, or stood with awkward body parts squashed against another passenger. The road was red and dusty and had many enormous potholes so the trotro had to frequently swerve into the oncoming lane or even further out to the edge of the ditch, dauntingly close to the enormous ant hills, swarming with big, crunchy, angry ants. 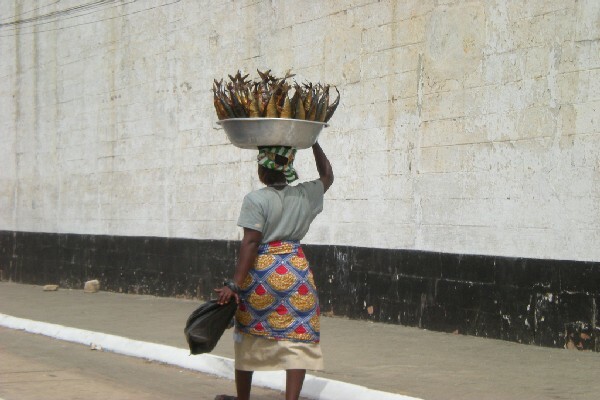 In Accra, there was traffic and crowds and noise and dust and heat. The markets spread out for acres. Tarps on the ground covered in chilis and tomatoes and cassava and potatoes and fabrics. Women with baskets balanced on their heads and babies wrapped around their midsections bargained fiercely. Vendors shouted, tugging at my elbow. Children stared at me, wide-eyed. Men followed me, propositioning me. Ten different languages were flung around in incomprehensible conversation around me in breeze-block cafes. I was terrified. In my photos from that time, I look relaxed, happy, eyes squinted to the sun, arms browner than I’d ever known them to be. But I remember feeling utterly out of my depth, out of my comfort zone, utterly intimidated. For the first time in years, I felt shy. I had no idea how to bargain. I had no idea how to find a minibus back to our little village when no minibuses were labelled and the bus yard had no signs, no organization, seemingly no one in charge at all. I had no idea what to order in cafes where there were no menus and where the language spoken was Twi, Ewe, Ga. I had traveled before, many times. I was well acquainted with hostel dorm and 3rd class trains. I had no fear of the kind-of familiar. I could speak French and understand German, Spanish and Dutch. I had felt quite capable and confident and adaptable. However, I had never traveled in a way that was so far outside of my realm of understanding and expectation. I was 23 and had been traveling since I was 19. 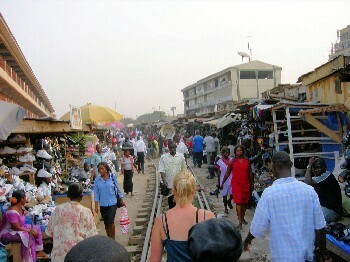 However, Ghana was the turning point for me. After Ghana, I knew I had to readjust my focus towards the scarier, unknown places. It’s much easier now.